AS became the Governor of the Central Bank in December 1995, a kind of a ‘coming-back-home’ for him. He returned to the bank with a lot of ideas in his head to reform not only the Central Bank, but also the whole financial system. At his first meeting with senior officers, he took stock of the bank’s position. His training at IMF as its Alternative Executive Director had brought him up to date with modern central banking. His wish was to practice them in the Central Bank. However, within less than two months, his plans for reforming the bank were shattered to pieces by LTTE. It exploded a powerful bomb in front of the bank’s Head Office in Fort destroying everything in vicinity. There were casualties on all fronts: men, material and money. Forty one bank employees lost their lives. About 1,200 employees got seriously injured. One wing of the bank building was completely gutted by fire. The columns of another wing were irreparably damaged, making even a temporary entry dangerous. The wing that was saved from fire or blast was filled with debris. All this and many other losses entailed money. When I saw AS in front of the still smoking bank building the following day, he was not a happy man at all. He was visibly down, but not out. The Central Bank is the heart of the country’s financial system. The destruction of the heart would have meant the destruction of the whole economy. That was why the terrorists had made a meticulous plan to attack it. Admitting defeat to terrorists would mean admitting the loss of everything. When I asked him ‘Governor, what do we do now?’ his answer was straight. He said, ‘We’ll rebuild a new central bank of which even the terrorists would be envious. The Phoenix will rise from the ashes.’ That was AS’s resolution and in the next eight years, he carried it out to the letter. AS appeared on national TV on the same day night and assured the public that the bank would start its operations in an alternative location immediately. He said that terrorists could destroy the Central Bank building but not the morale of its employees. Hence, the terrorists had failed to achieve their objective. This was reassuring enough for the bank’s stakeholders who had feared that the Central Bank had completely been destroyed by the terrorist attack. True to his word, the bank started its operations on the following day at its Staff Training College at Rajagiriya. All the senior officers were summoned to Rajagiriya and a staff meeting was held to identify the urgent work to be done and decide on how the bank should continue its normal operations. It was pointed out that certain foreign and local debt repayments had fallen due and they cannot be postponed even for a single day without compromising the reputation of the bank. It was unanimously decided by the senior management of the bank that the debt repayments should be honoured forthwith because the bank should in no way compromise its reputation. This staff meeting was followed by two other important meetings chaired by AS. I had the opportunity to be present at both these meetings. The first was a meeting with Chief Executive Officers of all the commercial banks. The banks were instructed to make an estimate of the currency held by them in their vaults and ensure that there would not be a shortage of currency in the market. That was because any shortage of currency would have been a serious dent in the reputation of the bank and it should have been avoided by all means. The Central Bank which could not open its vaults immediately too ran into a currency shortage for making numerous payments it had to make. On this count, the Bank of Ceylon, the largest and the most stable commercial bank, offered a credit line to the Central Bank so that the bank could make its immediate payments without losing its reputation. This was a rare occasion in which the Central Bank, the banker to commercial banks, had to rely on a commercial bank to settle its payments. But, it was necessary to assure the public that the bank had not been destroyed as targeted by terrorists. Similarly, People’s Bank offered its services to disburse funds and receive repayments under the bank’s development credit schemes which had been funded by many donors including the World Bank and ADB. Thus, funding flows to development projects continued without any interruption. Both the Bank of Ceylon and the People’s Bank came forward to assist EPF to receive contributions from employers and make refunds to members. Thus, Governor Jayawardena was able to marshal the needed support of all commercial banks to manage the financial economy without interruption. The second was a press briefing that was attended by both the local and international mediamen. This was the opportunity which AS used to communicate to the bank’s stakeholders. He wanted to convey them that the bank was not dead, it had started functioning again and it would soon restore normalcy as desired by its stakeholders. The media, exercising their right to extract all the information to keep their respective audiences informed of the true status, were posing scathing questions to AS and the senior officers of the bank. Their questions were particularly directed to ascertain whether there was any cover-up of the true damage caused to the bank. This was in fact a testing of the maturity and experience of AS who was a career central banker, a former Finance Secretary and an international civil servant. Prior to the media briefing, the senior management of the bank had participated in a crucial staff meeting and a meeting with CEOs of commercial banks. Hence, they were privy to what was happening and, therefore, could meet the press with one voice. That was important to quell the suspicions of the media personnel. Thus, the media briefing was successful in communicating the bank’s position to its stakeholders. What AS demonstrated was that the Central Bank’s communication policy was important in establishing its reputation among the stakeholders. The bank should not have any fear of coming before the media and explaining its position to the public. If it does not, the media as well as the public start suspecting that there could be some underhand dealings in the central bank which the bank attempts to conceal from the public. What AS did was the observance of the three basic pillars of a central bank’s communication policy. They were the clarity, transparency and predictability of central bank actions. The central bank should be ready to clarify not only what it has done or what it has proposed to do but also any rumour in the market damaging the bank’s reputation. In doing so, it should speak the truth so as to win the confidence of the public. If it does not, it cannot prevent the public from losing their confidence in central bank’s actions. The loss of confidence will erode the reputation of the bank as well. One important contributor to the rebuilding of the Central Bank while preserving its reputation after the bomb explosion was the excellent teamwork displayed by all the senior officers of the bank. There was healthy competition among the senior officers to do the best for the bank as it should be in any growing and dynamic institution. However, when it came to rebuilding and modernising the bank, all senior officers functioned as a single team demonstrating team-spirit in every move they made. Within teams, there were differing opinions expressed by team members. Harbouring differing opinions by staff was encouraged because that culture led to the building of a creative workforce. However, they were debated freely at team meetings allowing the Bank to choose the best path for its future development. The bank set up temporary field office at its Staff Training College at Rajagiriya. A.S occupied one of the lecture rooms which had a long table. Immediately, it was christened ‘The Long Room’. 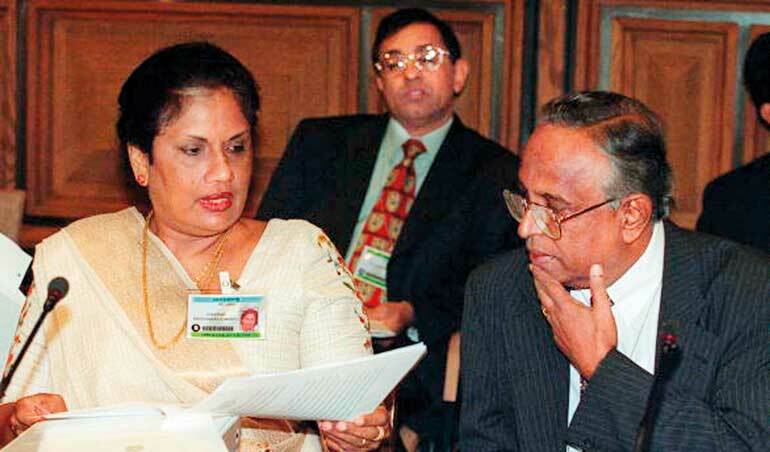 A.S. was at the head of the table, the two Deputy Governors, S. Easparathasan and P. Amarasinghe, next to him. All Executive Directors were seated wherever they could sit at the table. When heads of department visited him, he gave orders for various actions but not before writing them down in a CR register. That was to keep a record of all the orders he had issued. From that long table, AS, two Deputy Governors and Executive Directors mapped out the plans for the restoration of the bank. Because of the space limitation, the bank could accommodate only about 500 employees at the Staff Training College. Out of the total staff of about 2,200, about 1,200 had been injured and were at hospitals or at homes. Out of the balance 1,000, only a skeleton of about 500 were called for duty and the balance 500 were kept on compulsory leave. With that limited staff, the bank was not only able to do all the work it had to do, but also do a better job. This was an important discovery for A.S. At a heads of department meeting later, this matter was discussed and it was concluded that the bank had been overstaffed. It was necessary to bring down the staff strength to a lower level. A motto developed to describe the new situation: ‘Go for a lean but an efficient bank’. This was the birth of the modernisation project that was implemented in the bank from 2000 to 2005. Under AS’s guidance, several internal workshops were held by the bank to discuss the details of the modernisation project that was to be embarked by the bank. After the bank’s senior staff decided how the modernisation should be carried out, the bank was supported by IMF and the World Bank, IMF providing technical expertise and the World Bank, funding. I had been elevated to the Deputy Governor’s position at that time. Hence, I was commanded to chair the Steering Committee that planned and executed the modernisation programme under AS’s guidance. He gave me a free hand in running the affairs with the requirement that I consult him on all important matters. I was supported by the other Deputy Governor, the late P.M. Nagahawatta, all the Executive Directors and other staff. I had frequent meetings with AS and it was at those meetings that I came to know the real visionary in AS. The project was funded jointly by the Central Bank and the World Bank as an external funding agency. AS insisted that the World Bank funding was necessary to meet the foreign exchange commitments involved in the expenditure. It was a soft loan granted to the Government and the then Treasury Secretary, P B Jayasundera, made available the loan funds as a grant to the Central Bank. The modernisation project had four objectives: introduction of modern technology to the bank, updating the legal structure of the bank, creating a lean but efficient organisation and improvement of the talents and technical skills of the bank’s staff. The introduction of modern technology had three components: the establishment of a modern payments and settlement system including a real time gross settlement system, known as RTGS, the automation of the general ledger of the bank and the introduction of a scripless government securities system with the associated Central Depository System or CDS. It had already been noted that the bank had been overstaffed and it could be well managed with a staff of only 800. The Steering Committee mapped out offering a voluntary retirement scheme to the excess staff. It was to be funded up to 80% out of the World Bank money, to be received by the Government as a grant. Since the bank employees at all levels were enjoying high perks, it was necessary to offer them an equally-high compensation formula. Accordingly, the final formula offered was one of the best in the country but, in view of the available facilities in the bank, was not so generous as many had believed. Thus, the unions were against it and openly canvassed that the staff should not take it. This was a show of strength between AS and unions. AS explained the benefits to staff if they take up the voluntary retirement scheme in a series of long memos; though there was no interest shown by the staff for the scheme at first, toward the last few days, thanks to AS’s long memos, a renewed interest was shown by everyone. On the last day before the deadline, 1,000 bank employees had applied for voluntary retirement that strangely included almost all the office bearers of the main trade union that had been fiercely against it, the Central Bank Employees Union. The main asset which the Central Bank has is its staff but that staff would mean nothing if they have not upgraded its knowledge to be on par with the growing talent requirements of a modern central bank. AS wanted to convert the bank into a learning organisation. He allocated a generous budget for postgraduate studies and training. A special Management Development Centre was set up to train the staff continuously. A monthly public lecture programme was introduced in order to bring the staff and the public up to date on emerging development issues. Foreign experts in the relevant fields were engaged to deliver the lectures. Staff talent mapping and performance based staff evaluation methods were introduced. Learning at all levels and at all times was the motto of the bank. It was necessary to make sweeping changes to the law relating to central banking and commercial banking up to date. As a first step, Monetary Law Act was amended clearly focussing on two co-objectives of the bank: economic and price stability and financial system stability. Previously, the bank had multiple objectives which very often clashed with each other when the bank sought to attain them. Hence, the necessity for focussing on two main co-objectives. However, making economic and price stability a one of the co-objectives ran into trouble because no central bank in the world had this strange addendum called ‘economic’ added to price stability objective of the central bank. All of us were puzzled but AS had a fine explanation to the addendum. He said that if the bank focused only on price stability, it would run the risk of seeking to stabilise a price index which cold be attained by artificial means. An obvious misuse was price controls which would record a lower growth in the index today but would bring about inflation in the future. Hence, the central bank should not be complacent about until it has stability in the whole macroeconomy. The events that took place subsequently fully justified AS’s foresight. The above is only a few contributions which AS made for the long-term development of the Central Bank. It suffices to say that to do full justice to this visionary, one may have to write a book. He faced a lot of adversities during his tenure as the Governor. But his remarkable quality was that he managed to convert all those adversities into prosperities.